Greetings to you, dear reader, and at the same time a happy user of such an Apple gadget as the iPhone. In today's article I will tell you - as quickly as possible and without additional efforts to put the melody on the iPhone call. It would seem that this can be difficult - to install and add a melody to the ringing phoneYes, in many smartphones this is not difficult, but not on the iPhone, everything is much more complicated here. First of all, it is impossible to install and add a melody just like that; Only sounds in the M4R format are available for installation, and that is, if they are identified by the device as ringtones (ringtones). Secondly, you can download ringtones from the store through iTunes, but this is too expensive. You can create and add any melody to the call yourself. So, let's start creating and adding our own ringtone to the iPhone, let's go. To make (create) ringtones from ordinary melodies is not difficult, the main thing is to know how to do it. The first thing you need to do is run iTunes on your computer. 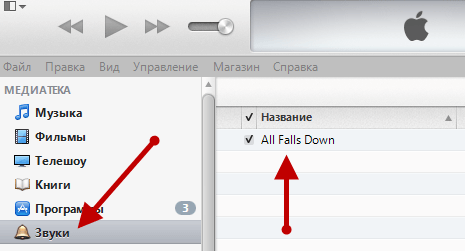 After the above simple operation, press CTRL + S in iTunes to see the side menu (it is with the help of it that we will manage the files). Next, in the library, select the item “Music” and transfer the file from which you are going to make ringtone (ringtones). Click the right mouse button on the file added to the iTunes library and select the “Details” item, then go to the “Settings” tab. We tick off the checkboxes: “Start” and “Stop Time” (here you need to specify a segment in 30 seconds). Next, click the “OK” button. Now click on the edited file with the right mouse button and select “Create version in ACC format”. Transfer the created iTunes file to the desktop of your computer. Now you need to make sure that file extensions are displayed on your computer. You can do it like this: Start-> Control Panel-> Folder (or folder property) -> “View” tab, then uncheck the checkbox “Hide extensions for registered file types”. Right-click on the file transferred to the desktop and replace the .m4a extension with .m4r (replace the letter). The final touch is left: in iTunes, select “Sounds” in the sidebar and transfer the edited file from the desktop to the field that appears. Now connect your iPhone to iTunes and sync by clicking the appropriate button. So, the ringtone (ringtones) is added to the iPhone, now it remains to install it and add it to the ringtone. Instructions on this subject can be found below. In this menu, you have a ringtone that we created earlier, in order to put it on the ringtone, just select it from the list. 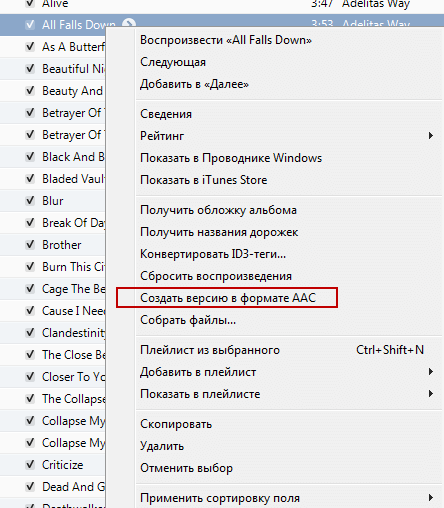 Today, this is all, I hope you could easily create, and then set your favorite ringtone in your iPhone. 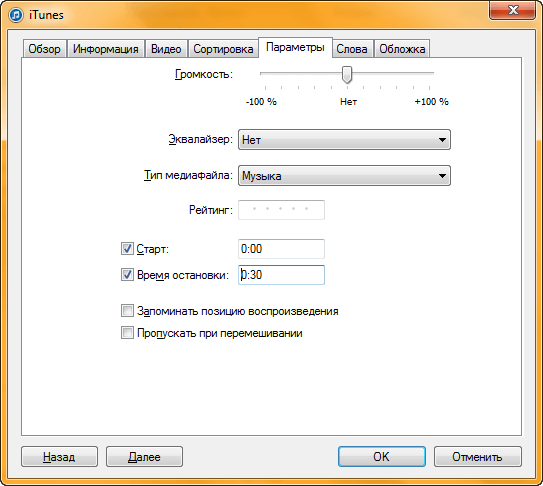 You also learned how to make your own ringtones from any songs, as you can see, making them is not at all difficult. I would be glad if you share your opinion on this material in the comments below. Attention: to leave a comment on the article you need to log in to the social network Vkontakte. Thanks for the help) One detail! You need to delete the shortened version of itunes music, otherwise the iphone is recorded when you synchronize not the sounds folder, but the music folder!